Someday we’ll all have robots to do our bidding… at least until they rise up and we end up doing their bidding. In the meantime, we can at least get a little taste of what life is like with robots handling annoying little tasks for us. The HÖHM DIRTBOT 2.0 Robotic Vacuum Cleaner does a great job of sucking up dust, pet hair, and light dirt from your hard flooring and low-pile rugs. It’s on sale right now on Amazon at its lowest price ever, down from $200 to just $79.95. Grab one and sit back while it tidies up your house for you. HÖHM DIRTBOT 2.0 ROBOTIC VACUUM: Systematically remove pet hair, dirt, dust and debris with a push of a button. Effectively clean hardwood, tile, marble and granite floors as well as area rugs. ULTRA THIN DESIGN: The DIRTBOT 2.0 will go where no vacuum has been before. Keep dust & dirt in check under beds, sofas and other hard-to-reach places. With only 2.4in/6cm in height your DIRTBOT 2.0 will leave no nook and cranny untouched. DOUBLE CLEANING SYSTEM: Your Dirtbot 2.0 tackles dirt in two ways: It’s two rotating, EXTRA-LONG SIDE BRUSHES pull dirt from corners and edges under the appliance where its met by the powerful suction of its 15W DC Motor. 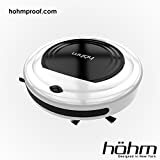 HÖHM SMART SENSOR TECHNOLOGY: A sophisticated 3-Sensor Feedback Mechanism will keep your DIRTBOT 2.0 away from stairs and drops higher than 5cm/2in and ensures careful cleaning around sensible furniture.